Hello, my dear friends! Not sure if it has caught your attention, but there is a merging micro trend of ultra romantic, almost poetic, styling on the 2018 runways. Highneck line and corsets, layers frills and ruffles but in sheer lace, tulle and sometime plastic -- all these conflicting elements delivered one message at the end, an ultra edge and feminine one: I love being the woman I am. I found it super romantic. It's been on my mind for a while to create one of my own modern romantic look. Finally I have gathered enough designs to make it happen during our trip to Montreal. My look is a slightly tune-down, more daytime-friendly version of the runway looks. 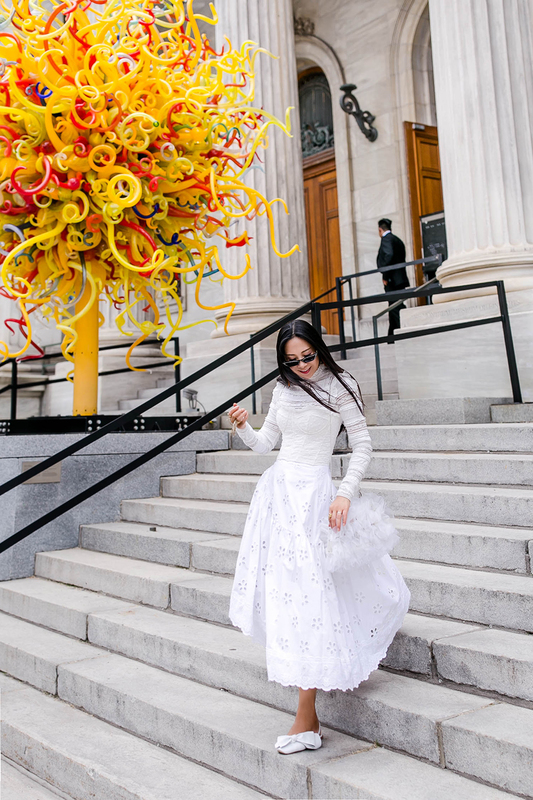 It was the easiest for me to style with all white pieces, including eyelet corset top with tiny frills, a lace turtleneck top from last winter, and an asymmetrical eyelet full skirt. I accessorized the look with a paired of bowed ballerina flats, not only they were travel-friendly, but also they make the whole look a little sweeter. So was the ruffled handbag made from plastic cupcake liners, It's edgy but it is sweet. 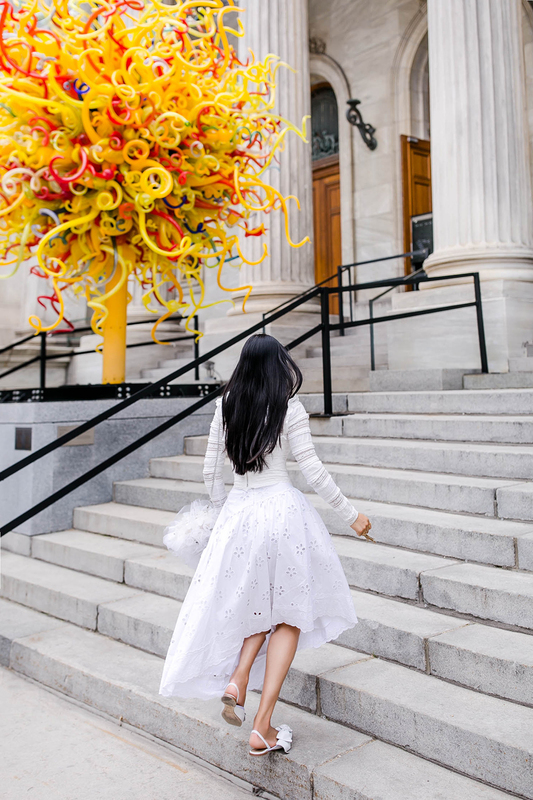 In the front of the Montreal Museum of Fine Arts, there is a blown glass sculpture by Dale Chihuly, and next to it, street art installation by Pierre Kwenders. Both art pieces are in bright yellow and orange hues, they are great contrast with the all white outfits while the underlying means of all is up to the interoperation of the viewer. Fashion is wearable art, I am very happy that I had this opportunity to photograph with these amazing art.